Access Pro will expertly analyze table fields, data types and properties, primary keys and indexes of Access tables. Whether you need to analyze one table or 100 tables, Access Pro will examine the 2 database (.mdb) files and generate a comprehensive report detailing the differences. 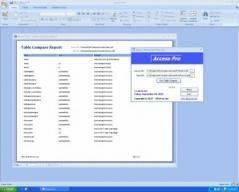 Access Pro was developed by DB-Pros for internal use in quickly solving issues with our customers' Access databases. By popular request, we decided to offer this utility program directly to our customers and the public. Now you can experience the power and benefits of this valuable software.